Water and wastewater agencies constantly balance the need to meet growing population demand and increasingly stringent water quality regulations with facility expansions, while also consciously monitoring energy consumption and associated operational costs. To better balance social, environmental and economic considerations, the industry often uses “triple bottom line” sustainability metrics in the decision-making process. Utilities across the globe have a growing interest in becoming more sustainable by optimizing their current energy consumption through renewable energy sources and treatment plant optimization to reduce their operations and maintenance expenditures. In addition, incentive programs from state and federal agencies, as well as private utility companies, have reduced the burden of energy expenditures to incentivize implementation of energy management strategies. These programs also have helped to encourage energy vigilance and replacement of antiquated systems. This article highlights examples of recent successful programs, including work for Louisville and Jefferson County Metropolitan Sewer District (MSD) in Louisville, Ky., and the Hampton Roads Sanitation District (HRSD) in Virginia Beach, Va.
MSD recently tasked HDR Inc. (HDR) with completing an Energy and Water Management Plan for their 120-mgd Morris Forman Water Quality Treatment Center (MFWQTC). This comprehensive optimization study was driven in part by the city of Louisville’s “One Water Initiative.” The primary goal of this program was for MSD and the Louisville Water Company (LWC) to cooperatively investigate methods to optimize treatment processes to ultimately reduce energy and water consumption at their facilities. 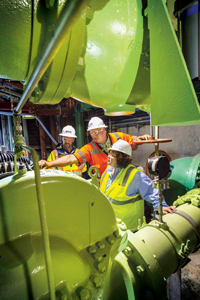 As a result, MSD and HDR examined ways to reduce electrical and natural gas energy consumption through a combination of operational adjustments, short- and long-term capital projects, changed operating practices and use of tools such as energy dashboards to increase operator awareness of energy consumption. A sludge drying system was examined for 20 months and found to be responsible for approximately $6.8 million in total energy and water costs. The first step in MSD’s energy optimization program was to define its current energy consumption baseline. To capture data on specific equipment usage, electric sub-meters were installed in strategic locations to monitor energy usage. The next step involved spending time at the facility with MSD staff to collaboratively identify and develop potential energy conservation measures (ECMs). As ECMs were identified and developed, they were prioritized using economic and non-economic measures. Implementation strategies then were developed for viable ECMs. The study also included a review of MSD’s rate structure with the utility companies to identify cost reduction strategies. The average electric rate, including demand charges, was approximately 6 cents per kilowatt hour, which is considered relatively low when compared to national averages. Demand charges are about 36% of the total electrical billings. The team evaluated more than 90 ECMs during this study, and a total of 14 implementable ECMs were identified. There is the potential for a $1.7 million overall reduction in energy and water annual costs. Some of the ECMs need to be tested prior to definite implementation, but it is expected there will be a 20% to 25% reduction of total utility billings once the ECMs are implemented. The expected simple payback is fewer than two years based on the capital investment required with a Net Present Value of over $19 million. HRSD also desired greater energy efficiency, and wanted to examine its 13 wastewater treatment plants in southeast Virginia to achieve this goal. HRSD’s operations department continues to improve upon its energy plan, which was initiated in 2010. HRSD also established a utility-wide energy management team to develop objectives and budgets for energy optimization. In 2011, HDR was tasked with conducting the first energy optimization at the Virginia Initiative Plant (VIP) in Norfolk. Its focus was to examine energy use from previous years and perform field investigations that could be used to develop ECMs. The ECMs addressed changes to equipment, operations and maintenance that could lead to reduced energy expenditures. HDR has performed two energy optimizations each year since that kickoff, totaling seven treatment plants reviewed. The evaluations identified the significance of real-time tracking of electrical demand for load shedding. A field investigation was performed at each plant and included a meeting with plant personnel, a plant tour and a comprehensive evaluation of each treatment process. ECMs were identified during the field investigation at each plant, and a debriefing workshop was held for plant personnel to discuss initial findings. HDR found that the largest consumers generally were aeration blowers and odor control fans, while recirculation pumps and centrifuges also accounted for more than 10% of plant energy usage. Similar to the Louisville example, HRSD’s existing plants can be modified to address the “triple bottom line” without major capital costs or structural changes. Minor modifications to process equipment, electrical demand peaking and process operations can provide low-capital-cost energy savings with short paybacks. HRSD’s initial phases of the energy optimizations were to characterize current energy usage at the plants. Historical electrical bills were used to determine how individual wastewater treatment processes were consuming energy at the plants. Energy consumption per gallon treated, denoted as “energy intensity,” was calculated to establish the plants’ baseline energy usage rate. Energy intensity values give a baseline energy performance value to a plant, but should not be used as a definitive value of efficiency. Process assemblies and nutrient limitations may dictate the power requirement necessary for complete wastewater treatment, especially if biological nutrient removal is used to meet total maximum daily loads for nitrogen and phosphorus. HRSD’s Atlantic Treatment Plant discharges to the Atlantic Ocean and only regulates effluent biological oxygen demand (BOD) while Nansemond and other HRSD plants face stricter nutrient limits as part of the Chesapeake Bay Preservation Program (total nitrogen limit of 5 to 8 mg/L and 1 mg/L total phosphorus). After conducting the energy optimizations, it was clear that individual plant processes played a key role in understanding the energy intensity at each plant. Plants with robust treatment methods that required large pumps and blowers typically had the highest associated energy intensity. Plant management officials also had taken widespread measures to reduce power consumption, including load shedding during peak demand, shutdown of unnecessary pumping and dewatering improvements to increase solids percentage fed into energy-intensive centrifuges. Real-time electrical demand should be monitored in real time to assess distribution of energy usage and reduce demand charges. Variable frequency drives should be added to motors to increase energy efficiency and reduce power cost when cost-effective. This usually applies to large motors (greater than 30 hp). Modifications should be made to lighting systems to improve accessibility for maintenance crews and improve energy efficiency. Utilities should consider installing timers and motion sensors in facilities. Pump operation efficiency can be improved by adjusting sheaves or impellers to operate pumps more efficiently through reduced speed. Plant energy teams should be created to observe power usage and discuss energy goals and ideas. Teams should meet monthly and be responsible for monitoring energy consumers and investigating energy conservation methods that could be useful. Odor control system operations should be investigated to reduce energy usage while maintaining system effectiveness. Aeration systems should be optimized to provide the necessary blower capacity for each plant at most efficient operating points. Alternative sources of energy, such as fats, oils and grease (FOG), should be investigated. Since the completion of the first energy optimization, HRSD has achieved significant energy savings. In total, 25 ECMs have been implemented successfully with large yearly savings of more than $500,000. Mike Rudisell, P.E., is senior project manager for HDR Inc. Rudisell can be reached at [email protected] or 502.909.3273. Christina Alito, Ph.D., P.E., is water/wastewater engineer for HDR Inc. Alito can be reached at [email protected] or 571.327.5875. Stephanie Spalding, P.E., ENV SP, is water/wastewater project manager for HDR Inc. Spalding can be reached at [email protected] or 757.222.1590.